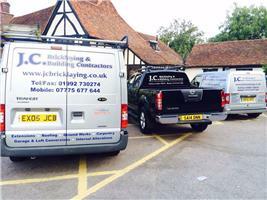 J C Bricklaying and Building Contractors - Builder, Roofer based in North Weald, Essex. J.C. Bricklaying & Building Contractors have been established for 25 years and have a wealth of experience, delivering high quality domestic construction projects. We take pride in seeing a project through to completion and work closely with clients to achieve their project aims within an efficient time scale. We cover all aspects of building services such as single and double storey extension projects, roofing, carpentry, kitchen and bathroom installation, conservatories, internal alterations (structural steel work, internal walls, open planning), driveways and patios, garden walls, fencing and ground works, electrical installations, plumbing, and a variety of insurance works. We are a friendly and trustworthy company with a professional and efficient approach to all projects and are renowned for our excellent levels of customer satisfaction. We work predominately in the Essex and Hertfordshire areas and have excellent references available on request and examples of our work that we would be very happy to share with you. We have comprehensive insurance cover of up to £2 million on all our projects and believe in offering good quality, service and value for money. We would welcome the opportunity to discuss your project aspirations and provide you with a totally free, no obligation detailed written quotation. Please feel free to call me on 07775 677 644 should you wish to discuss your project requirements further. JC Bricklaying & Building Contractors have now taken delivery of a digger and can offer the services of digging out foundations, preparation for new driveways and digging out landscapes in preparation for ponds.